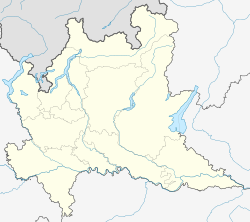 Pusiano (Brianzöö: Püsian [pyˈzjãː]) is a comune (municipality) in the Province of Como, in the Italian region Lombardy, located about 40 kilometres (25 mi) north of Milan, and about 15 kilometres (9 mi) east of Como. As of 31 December 2004, it had a population of 1,225, and an area of 3.2 square kilometres (1.2 sq mi). Pusiano borders the following municipalities: Canzo, Cesana Brianza, Eupilio. This page was last edited on 2 September 2018, at 14:45 (UTC).